It's fun to get the newsletter! You get the inside scoop! Click here. This sock pattern, our best seller, shows you how to make toe-up socks step-by-step. 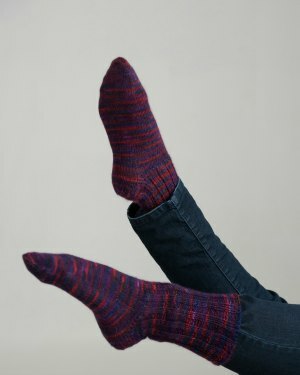 It includes many photos to help you on your way to making great socks! Because you are fitting as you go, the socks are always perfect when finished. The pattern instructions include directions for using double-pointed needles, 2 circular needles, or 1 circular needle--take your pick! Choose any weight of yarn.